WARNING: Chronic immunosuppression with this purine antimetabolite increases risk of neoplasia in humans. Physicians using this drug should be very familiar with this risk as well as with the mutagenic potential to both men and women and with possible hematologic toxicities. See WARNINGS . AZASAN®, an immunosuppressive antimetabolite, is available in tablet form for oral administration. Each scored tablet contains 25 mg, 75 mg or 100 mg azathioprine and the inactive ingredients lactose monohydrate, pregelatinized starch, povidone, corn starch, magnesium stearate, and stearic acid. 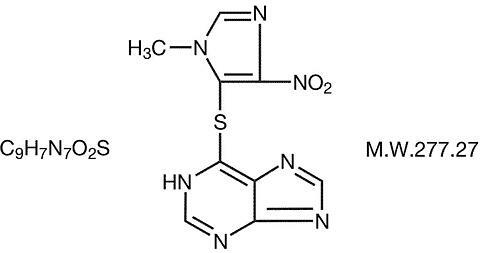 It is an imidazolyl derivative of 6-mercaptopurine (PURINETHOL®) and many of its biological effects are similar to those of the parent compound. Metabolism: Azathioprine is well absorbed following oral administration. Maximum serum radioactivity occurs at 1 to 2 hours after oral 35 S-azathioprine and decays with a half-life of 5 hours. This is not an estimate of the half-life of azathioprine itself but is the decay rate for all 35 S-containing metabolites of the drug. Because of extensive metabolism, only a fraction of the radioactivity is present as azathioprine. Usual doses produce blood levels of azathioprine, and of mercaptopurine derived from it, which are low (<1 mcg/mL). Blood levels are of little predictive value for therapy since the magnitude and duration of clinical effects correlate with thiopurine nucleotide levels in tissues rather than with plasma drug levels. Azathioprine and mercaptopurine are moderately bound to serum proteins (30%) and are partially dialyzable. Azathioprine is cleaved in vivo to mercaptopurine. Both compounds are rapidly eliminated from blood and are oxidized or methylated in erythrocytes and liver; no azathioprine or mercaptopurine is detectable in urine after 8 hours. Conversion to inactive 6-thiouric acid by xanthine oxidase is an important degradative pathway, and the inhibition of this pathway in patients receiving allopurinol is the basis for the azathioprine dosage reduction required in these patients (see PRECAUTIONS : Drug Interactions ). Proportions of metabolites are different in individual patients, and this presumably accounts for variable magnitude and duration of drug effects. Renal clearance is probably not important in predicting biological effectiveness or toxicities, although dose reduction is practiced in patients with poor renal function. Homograft Survival: Summary information from transplant centers and registries indicates relatively universal use of AZASAN® with or without other immunosuppressive agents. Although the use of azathioprine for inhibition of renal homograft rejection is well established, the mechanism(s) for this action are somewhat obscure. The drug suppresses hypersensitivities of the cell-mediated type and causes variable alterations in antibody production. Suppression of T-cell effects, including ablation of T-cell suppression, is dependent on the temporal relationship to antigenic stimulus or engraftment. This agent has little effect on established graft rejections or secondary responses. AZASAN® is indicated as an adjunct for the prevention of rejection in renal homotransplantation. It is also indicated for the management of severe, active rheumatoid arthritis unresponsive to rest, aspirin, or other nonsteroidal anti-inflammatory drugs, or to agents in the class of which gold is an example. Renal Homotransplantation: AZASAN® is indicated as an adjunct for the prevention of rejection in renal homotransplantation. Experience with over 16,000 transplants shows a 5-year patient survival of 35% to 55%, but this is dependent on donor, match for HLA antigens, anti-donor and anti B-cell alloantigen antibody, and other variables. The effect of azathioprine on these variables has not been tested in controlled trials. Rheumatoid Arthritis: AZASAN® is indicated only in adult patients meeting criteria for classic or definite rheumatoid arthritis as specified by the American Rheumatism Association. AZASAN® should be restricted to patients with severe, active and erosive disease not responsive to conventional management including rest, aspirin, or other nonsteroidal drugs or to agents in the class of which gold is an example. Rest, physiotherapy, and salicylates should be continued while AZASAN® is given, but it may be possible to reduce the dose of corticosteroids in patients on AZASAN®. The combined use of AZASAN® with gold, antimalarials, or penicillamine has not been studied for either added benefit or unexpected adverse effects. The use of AZASAN® with these agents cannot be recommended. AZASAN® should not be given to patients who have shown hypersensitivity to the drug. AZASAN® should not be used for treating rheumatoid arthritis in pregnant women. Patients with rheumatoid arthritis previously treated with alkylating agents (cyclophosphamide, chlorambucil, melphalan, or others) may have a prohibitive risk of neoplasia if treated with AZASAN®. Severe leukopenia, thrombocytopenia, macrocytic anemia, and/or pancytopenia may occur in patients on AZASAN®. Severe bone marrow depression may also occur. Individuals with inherited low or absent thiopurine methyltransferase (TPMT) activity may be at increased risk of developing severe, life-threatening myelotoxicity from AZASAN®. Prospective TPMT genotyping or phenotyping may help identify such patients. Hematologic toxicities are dose related and may be more severe in renal transplant patients whose homograft is undergoing rejection. It is suggested that patients on AZASAN® have complete blood counts, including platelet counts, weekly during the first month, twice monthly for the second and third months of treatment, then monthly or more frequently if dosage alterations or other therapy changes are necessary. Delayed hematologic suppression may occur. Prompt reduction in dosage or temporary withdrawal of the drug may be necessary if there is a rapid fall in, or persistently low leukocyte count, or other evidence of bone marrow depression. Leukopenia does not correlate with therapeutic effect; therefore, the dose should not be increased intentionally to lower the white blood cell count. AZASAN® is mutagenic in animals and humans, carcinogenic in animals, and may increase the patient's risk of neoplasia . Renal transplant patients are known to have an increased risk of malignancy, predominantly skin cancer and reticulum cell or lymphomatous tumors. The risk of post-transplant lymphomas may be increased in patients who receive aggressive treatment with immunosuppressive drugs. The degree of immunosuppression is determined not only by the immunosuppressive regimen but also by a number of other patient factors. The number of immunosuppressive agents may not necessarily increase the risk of post-transplant lymphomas. However, transplant patients who receive multiple immunosuppressive agents may be at risk for over-immunosuppression; therefore, immunosuppressive drug therapy should be maintained at the lowest effective levels. Information is available on the spontaneous neoplasia risk in rheumatoid arthritis, and on neoplasia following immunosuppressive therapy of other autoimmune disease. It has not been possible to define the precise risk of neoplasia due to AZASAN®. The data suggest the risk may be elevated in patients with rheumatoid arthritis, though lower than for renal transplant patients. However, acute myelogenous leukemia as well as solid tumors have been reported in patients with rheumatoid arthritis who have received azathioprine. Data on neoplasia in patients receiving AZASAN® can be found under ADVERSE REACTIONS . AZASAN® has been reported to cause temporary depression in spermatogenesis and reduction in sperm viability and sperm count in mice at doses 10 times the human therapeutic dose; a reduced percentage of fertile matings occurred when animals received 5 mg/kg. Pregnancy: Pregnancy Category D . AZASAN® can cause fetal harm when administered to a pregnant woman. AZASAN® should not be given during pregnancy without careful weighing of risk versus benefit. Whenever possible, use of AZASAN® in pregnant patients should be avoided. This drug should not be used for treating rheumatoid arthritis in pregnant women. AZASAN® is teratogenic in rabbits and mice when given in doses equivalent to the human dose (5 mg/kg daily). Abnormalities included skeletal malformations and visceral anomalies. Limited immunologic and other abnormalities have occurred in a few infants born of renal allograft recipients on AZASAN®. In a detailed case report, documented lymphopenia, diminished IgG and IgM levels, CMV infection, and a decreased thymic shadow were noted in an infant born to a mother receiving 150 mg azathioprine and 30 mg prednisone daily throughout pregnancy. At 10 weeks most features were normalized. DeWitte et al reported pancytopenia and severe immune deficiency in a preterm infant whose mother received 125 mg azathioprine and 12.5 mg prednisone daily. There have been two published reports of abnormal physical findings. Williamson and Karp described an infant born with preaxial polydactyly whose mother received azathioprine 200 mg daily and prednisone 20 mg every other day during pregnancy. Tallent et al described an infant with a large myelomeningocele in the upper lumbar region, bilateral dislocated hips, and bilateral talipes equinovarus. The father was on long-term azathioprine therapy. Benefit versus risk must be weighed carefully before use of AZASAN® in patients of reproductive potential. There are no adequate and well-controlled studies in pregnant women. If this drug is used during pregnancy or if the patient becomes pregnant while taking this drug, the patient should be apprised of the potential hazard to the fetus. Women of childbearing age should be advised to avoid becoming pregnant. General: A gastrointestinal hypersensitivity reaction characterized by severe nausea and vomiting has been reported. These symptoms may also be accompanied by diarrhea, rash, fever, malaise, myalgias, elevations in liver enzymes, and occasionally, hypotension. Symptoms of gastrointestinal toxicity most often develop within the first several weeks of AZASAN® therapy and are reversible upon discontinuation of the drug. The reaction can recur within hours after rechallenge with a single dose of AZASAN®. Information for Patients: Patients being started on AZASAN® should be informed of the necessity of periodic blood counts while they are receiving the drug and should be encouraged to report any unusual bleeding or bruising to their physician. They should be informed of the danger of infection while receiving AZASAN® and asked to report signs and symptoms of infection to their physician. Careful dosage instructions should be given to the patient, especially when AZASAN® is being administered in the presence of impaired renal function or concomitantly with allopurinol (see PRECAUTIONS - Drug Interactions subsection and DOSAGE AND ADMINISTRATION ). Patients should be advised of the potential risks of the use of AZASAN® during pregnancy and during the nursing period. The increased risk of neoplasia following therapy with AZASAN® should be explained to the patient. Laboratory Tests: See WARNINGS and ADVERSE REACTIONS sections. Use with Allopurinol: The principal pathway for detoxification of AZASAN® is inhibited by allopurinol. Patients receiving AZASAN® and allopurinol concomitantly should have a dose reduction of AZASAN®, to approximately 1/3 to 1/4 the usual dose. Use with Other Agents Affecting Myelopoiesis: Drugs which may affect leukocyte production, including co-trimoxazole, may lead to exaggerated leukopenia, especially in renal transplant recipients. Use with Angiotensin-Converting Enzyme Inhibitors: The use of angiotensin-converting enzyme inhibitors to control hypertension in patients on azathioprine has been reported to induce severe leukopenia. Pregnancy: Teratogenic Effects: Pregnancy Category D. See WARNINGS section. Nursing Mothers: The use of AZASAN® in nursing mothers is not recommended. Azathioprine or its metabolites are transferred at low levels both transplacentally and in breast milk. Because of the potential for tumorgenicity shown for azathioprine, a decision should be made whether to discontinue nursing or discontinue the drug, taking into account the importance of the drug to the mother. Pediatric Use: Safety and efficacy of azathioprine in pediatric patients have not been established. * Data on the rate and risk of neoplasia among persons with rheumatoid arthritis treated with azathioprine are limited. The incidence of lymphoproliferative disease in patients with RA appears to be significantly higher than that in the general population. In one completed study, the rate of lymphoproliferative disease in RA patients receiving higher than recommended doses of azathioprine (5 mg/kg/day) was 1.8 cases per 1000 patient years of follow-up, compared with 0.8 cases per 1000 patient years of follow-up in those not receiving azathioprine. However, the proportion of the increased risk attributable to the azathioprine dosage or to other therapies (i.e., alkylating agents) received by azathioprine-treated patients cannot be determined. Hematologic: Leukopenia and/or thrombocytopenia are dose dependent and may occur late in the course of therapy with AZASAN®. Dose reduction or temporary withdrawal allows reversal of these toxicities. Infection may occur as a secondary manifestation of bone marrow suppression or leukopenia, but the incidence of infection in renal homotransplantation is 30 to 60 times that in rheumatoid arthritis. Macrocytic anemia and/or bleeding have been reported in two patients on azathioprine. Gastrointestinal: Nausea and vomiting may occur within the first few months of AZASAN® therapy, and occurred in approximately 12% of 676 rheumatoid arthritis patients. The frequency of gastric disturbance often can be reduced by administration of the drug in divided doses and/or after meals. However, in some patients, nausea and vomiting may be severe and may be accompanied by symptoms such as diarrhea, fever, malaise, and myalgias (see PRECAUTIONS ). Vomiting with abdominal pain may occur rarely with a hypersensitivity pancreatitis. Hepatotoxicity manifest by elevation of serum alkaline phosphatase, bilirubin, and/or serum transaminases is known to occur following azathioprine use, primarily in allograft recipients. Hepatotoxicity has been uncommon (less than 1%) in rheumatoid arthritis patients. Hepatotoxicity following transplantation most often occurs within 6 months of transplantation and is generally reversible after interruption of AZASAN®. A rare, but life-threatening hepatic veno-occlusive disease associated with chronic administration of azathioprine has been described in transplant patients and in one patient receiving azathioprine for panuveitis. Periodic measurement of serum transaminases, alkaline phosphatase, and bilirubin is indicated for early detection of hepatotoxicity. If hepatic veno-occlusive disease is clinically suspected, AZASAN® should be permanently withdrawn. Others: Additional side effects of low frequency have been reported. These include skin rashes (approximately 2%), alopecia, fever, arthralgias, diarrhea, steatorrhea and negative nitrogen balance (all less than 1%). The oral LD 50 s for single doses of AZASAN® in mice and rats are 2500 mg/kg and 400 mg/kg, respectively. Very large doses of this antimetabolite may lead to marrow hypoplasia, bleeding, infection, and death. About 30% of AZASAN® is bound to serum proteins, but approximately 45% is removed during an 8-hour hemodialysis. A single case has been reported of a renal transplant patient who ingested a single dose of 7500 mg azathioprine. The immediate toxic reactions were nausea, vomiting, and diarrhea, followed by mild leukopenia and mild abnormalities in liver function. The white blood cell count, SGOT, and bilirubin returned to normal 6 days after the overdose. Renal Homotransplantation: The dose of AZASAN® required to prevent rejection and minimize toxicity will vary with individual patients; this necessitates careful management. The initial dose is usually 3 to 5 mg/kg daily, beginning at the time of transplant. AZASAN® is usually given as a single daily dose on the day of, and in a minority of cases 1 to 3 days before, transplantation. AZASAN® is often initiated with the intravenous administration of the sodium salt, with subsequent use of tablets (at the same dose level) after the postoperative period. Intravenous administration of the sodium salt is indicated only in patients unable to tolerate oral medications. Dose reduction to maintenance levels of 1 to 3 mg/kg daily is usually possible. The dose of AZASAN® should not be increased to toxic levels because of threatened rejection. Discontinuation may be necessary for severe hematologic or other toxicity, even if rejection of the homograft may be a consequence of drug withdrawal. Rheumatoid Arthritis: AZASAN® is usually given on a daily basis. The initial dose should be approximately 1 mg/kg (50 to 100 mg) given as a single dose or on a twice daily schedule. The dose may be increased, beginning at 6 to 8 weeks and thereafter by steps at 4-week intervals, if there are no serious toxicities and if initial response is unsatisfactory. Dose increments should be 0.5 mg/kg daily, up to a maximum dose of 2.5 mg/kg/day. Therapeutic response occurs after several weeks of treatment, usually 6 to 8; an adequate trial should be a minimum of 12 weeks. Patients not improved after 12 weeks can be considered refractory. AZASAN® may be continued long-term in patients with clinical response, but patients should be monitored carefully, and gradual dosage reduction should be attempted to reduce risk of toxicities. Maintenance therapy should be at the lowest effective dose, and the dose given can be lowered decrementally with changes of 0.5 mg/kg or approximately 25 mg daily every 4 weeks while other therapy is kept constant. The optimum duration of maintenance AZASAN® has not been determined. AZASAN® can be discontinued abruptly, but delayed effects are possible. Use in Renal Dysfunction: Relatively oliguric patients, especially those with tubular necrosis in the immediate post-cadaveric transplant period, may have delayed clearance of AZASAN® or its metabolites, may be particularly sensitive to this drug, and are usually given lower doses. Procedures for proper handling and disposal of this immunosuppressive antimetabolite drug should be considered. Several guidelines on this subject have been published. 1-7 There is no general agreement that all of the procedures recommended in the guideline are necessary or appropriate. AMA Council Report, Guidelines for Handling Parenteral Antineoplastics. JAMA , 1985;253(11):1590-1592. National Study Commission on Cytotoxic Exposure - Recommendations for Handling Cytotoxic Agents. Available from Louis P. Jeffrey, ScD., Chairman, National Study Commission on Cytotoxic Exposure, Massachusetts College of Pharmacy and Allied Health Sciences, 179 Longwood Avenue, Boston, Massachusetts 02115. Clinical Oncological Society of Australia, Guidelines and Recommendations for Safe Handling of Antineoplastic Agents. Med J Australia, 1983;1:426-428. Jones RB, et al: Safe Handling of Chemotherapeutic Agents: A Report from the Mount Sinai Medical Center. CA-A Cancer Journal for Clinicians , 1983;(Sept/Oct) 258-263. American Society of Hospital Pharmacists Technical Assistance Bulletin on Handling Cytotoxic and Hazardous Drugs. Am J Hosp Pharm , 1990;47:1033-1049. OSHA Work-Practice Guidelines for Personnel Dealing with Cytotoxic (Antineoplastic) Drugs. Am J Hosp Pharm , 1986; 43:1193-1204. AZASAN® is a registered trademark of Aaipharma LLC.